Carwyn Jones has formally triggered the starting gun on the Welsh Labour leadership contest. Writing to the party's chair Margaret Thomas, Mr Jones said he was giving "formal notice of his intention to stand down in December". The first minister said officials had agreed a timetable that allows for the election to begin immediately, with the result to be announced on 6 December. The letter was revealed in a Twitter post by Llanelli AM Lee Waters. Mr Jones intends to resign following his final First Minister's Questions on 11 December. Nominations are expected to open on Thursday and close on 3 October at 12pm. 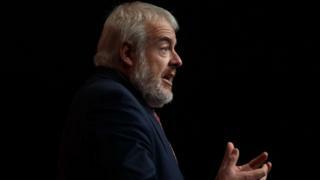 Carwyn Jones announced his intention to quit at Welsh Labour conference in April. Candidates need the support of five other AMs to get on the Welsh Labour ballot paper. Most AMs are backing Finance Secretary Mark Drakeford, while five are supporting his cabinet colleague Vaughan Gething. The first minister said on Monday that he would be willing to nominate Eluned Morgan, following a row over the lack of a woman candidate on the ballot. With four other AMs backing her, Mr Jones' move virtually guaranteed her place in the contest.